191. P. S. Clark, "Chinese Launch Vehicles - Feng Bao 1", Jane's Intelligence Review, April 1992, pp. 188-191. 192. P. S. Clark, "Chinese Launch Vehicles - Chang Zheng 1", Jane's Intelligence Review, November 1991, pp. 508-511. To satisfy the need for launching small satellites into LEO, the PRC developed the CZ-1D launch vehicle. The CZ-1D design consists of a 2-stage vehicle with the first stage burning UDMH and nitric acid whereas the second stage utilizes UDMH and nitrogen tetroxide. The LM-1D is a 3-stage rocket derived from the 1970 LM-1. 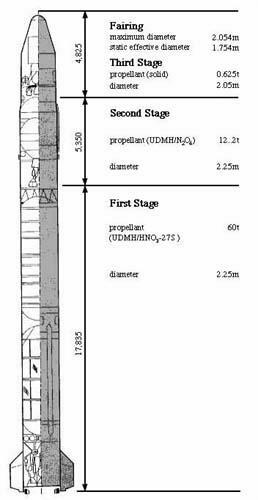 It is actually a 2-stage DF-4 surmounted by a solid-fuel stage containing 0.625 t of fuel. Although slightly smaller than the LM-1, its performance is better. The payload capacity of the CZ-1D is 900 kg to LEO and 300 kg to a sun-synchronous orbit (References 159-161, 191-192).